Warren’s Southern Gardens is a Houston garden center located at 1675 Northpark Drive in Kingwood, TX 77339. At Warren’s, our goal is to provide customers with the best variety and highest quality flowers, plants, trees and shrubs, gifts for your home and garden. 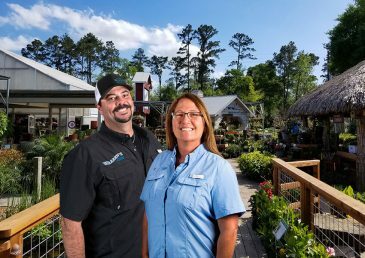 To go along with our outstanding gardening products, we provide Houston with experienced and knowledgeable staff to diagnose and offer solutions to your lawn and garden questions. Bernice and Dean Warren, the owners of Warren’s Southern Gardens, are committed to providing area residents with not only a one-of-a-kind Greater Houston area garden center, but Warren’s offers a complete landscape and design division, (Warren’s Outdoor Living) to create custom outdoor living spaces for our customers. We look forward to serving you when you come visit us at Warren’s Southern Gardens.